Assassin’s Creed Origins is, without a doubt, one of the biggest games to have come out this year. It’s Ubisoft’s latest entry in a series that kicked off back in 2007, and one of the top video game blockbusters hitting shelves this week, so it’s not surprising the game was chosen to feature in Conan O’Brien’s show “Clueless Gamer”. In this edition of the popular comedic segment the late night talk show host is joined by none other than NFL quarterback Aaron Rodgers. a man who recently suffered an injury which might have put him out of playing for the rest of the NFL season. Actually, Rodgers revealed to O’Brien 13 screws were needed to repair his collarbone, giving us an idea of how serious the injury he sustained on October 15 was. This did not stop him from having fun playing Assassin’s Creed Origins with Conan, although both he and the late night talk show host seemed just as puzzled when Conan’s assistant tried to explain Assassin’s Creed convoluted plot to them. But Conan does seem to enjoy riding a chariot in the game (something that reminds him of the Grand Theft Auto games) and also appears to have fun with a hilarious side quest involving hippos. 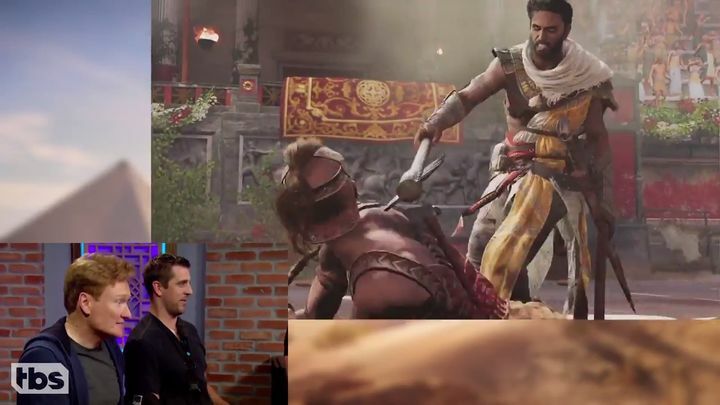 The duo are later joined by one of Rodgers’ teammates, who disappoints Conan when he decides to spare an opponent in Assassin’s Creed Origins gladiatorial combat. Like other Clueless Gamer episodes, this one’s not only worth watching for its comedy value alone, but also to take a sneak peek at one of the biggest video games to be released this year no doubt.